Chances are if you’re reading this, you’ve heard about the firestorm surrounding this limited edition, sold-out release. Tom Savini’s remake of the seminal George Romero zombie classic was first released in 1990 to generally underwhelming effect. It didn’t fare well at the box office or with critics. More than 20 years later, the 1990 Night of the Living Dead has achieved cult classic status. A Blu-ray release seemed inevitable, but Twilight Time managed to turn it into an event for horror buffs. For the uninitiated, Twilight Time is a small specialty label that licenses vintage films and releases them as true limited editions. They only press 3,000 copies and instead of the usual retail venues, they can only be ordered through their distributor, Screen Archives. 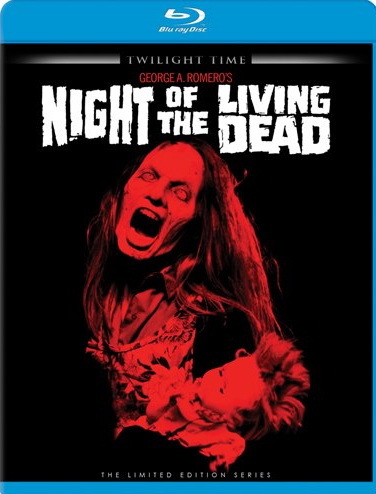 Night of the Living Dead sparked a frenzy that resulted in an eight-day sell out during the pre-order period. The Blu-ray wasn’t scheduled for release until October 9, but the supply was completely exhausted well before that. Twilight Time has earned a solid reputation among movie collectors with a sterling track record of technically sound presentations. So what happened with Living Dead that turned this seemingly slam-dunk release into a PR disaster? Keep in mind, Twilight Time works with what they’re provided by the studio who is licensing the title to them. And in this case, Sony Pictures Entertainment gave them a high definition transfer made in 2010. According to a statement by Twilight Time on their Facebook page, this transfer was overseen by the film’s director of photography Frank Prinzi. The overall look of the film was tweaked, with a darker picture and noticeably desaturated color. Much of the film has a blue tint that gives it a cooler, moodier look than it has ever had before. Let me step back from the visual presentation for a moment and talk about the film itself. While it certainly doesn’t supplant the original, it’s a good update that has aged surprisingly well over the years. This is largely due to how straight everything is played, without giving into cheesiness. The screenplay was by George Romero, who rewrote the screenplay he and John A. Russo did for his 1968 original. For the first half, at least, the story stays pretty faithful to the ’68 version. Barbara (Patricia Tallman) flees a cemetery after a zombie attack that leaves her brother dead. She takes shelter in a farmhouse, soon joined by Ben (Tony Todd). Eventually they realize they’re not alone in the house. Hiding in the basement are two couples, Harry (an over-the-top Tom Towles) and Helen (McKee Anderson) along with Tom (William Butler) and Judy Rose (Katie Finneran). The house remains under siege by zombies throughout the night. Patience runs thin inside, as the four work to keep the place boarded up. The big reinterpretation for those only familiar with Romero original is Barbara’s confident, aggressive attitude. In the original, Barbara was basically a nutcase – scared witless to the point of not being able to function. Here she rises to the challenges presented and become heroic. In a moment of clarity, she even attempts to put the whole zombie phenomenon in perspective with a minimalist analysis of the situation late in the film. Aside from Towles, whose ranting and ravings as Harry is more comical than threatening, the cast is strong. While the gore quotient is somewhat amped up 22 years after Romero’s, it never gets out of hand. Okay, back to the Twilight Time Blu-ray. If you know the film well and you want it to look like it always has, you’re sure to be disappointed. I completely sympathize with anyone who feels the revisionism was unwarranted and out of line. In fact, ultimately I agree that the film’s color timing should’ve been left as it was. That said, I would venture the thought that some folks are caught up in the hysteria at the moment. I don’t think the darker picture and blue tint are quite as pronounced as some are claiming. The opening few minutes of the film look “accurate” and there is a scene about 27 minutes in (after Ben and Barbara meet the people hiding in the basement) that looks normal as well. The second half of the film in general looks less obviously tweaked than then the opening act. If you absolutely hate the “new look,” I understand if you’re not interested in the positive aspects of the transfer. Those aspects include impressive clarity, greatly improved over previous home video releases, throughout the film. The transfer is free of visual artifacts and was sourced from a clean print. All things considered, the apparently intentional changes to the color grading and contrast are the only arguably bad aspects of this otherwise strong transfer. I realize that using words like “only” and “arguably” might make me sound like an apologist here, but I’m trying to be objective. If you haven’t ever seen the film before, there’s a good chance you won’t find any fault with this visual presentation. The DTS-HD MA 5.1 soundtrack is good without being remarkable. The best thing about it is that the dialogue is intelligible and mixed at an appropriate level. The score is also clear and well integrated in the mix. Surrounds are a bit light, but atmospheric sounds come through just fine. There’s also a fair amount of LFE activity. It should be remembered that this is a 22-year-old movie that had a relatively low budget to begin with. That fact is reflected in the simple sound design. The audio controversy is over the absence of a couple of foley effects that were audible in previous mixes. While not ideal, I’m not sure it would even be a point of serious concern were it not in addition to the existing picture concerns. Twilight Time has included their customary isolated score track as a bonus, presented in DTS-HD MA 2.0. They’ve also ported over Savini’s commentary track that was previously available on DVD. The original theatrical trailer is tossed in as well, which carries a little extra value considering it provides a visual reference for how the film originally looked. A nice little booklet includes a well written essay about the film. Considering Twilight Time sold out their run, you either own Night of the Living Dead or are considering buying it on the collector’s market. I don’t believe the Blu-ray is anywhere close to being “unwatchable,” as some reviewers and fans have adamantly claimed. It’s a good presentation of an alternate vision of the film, a vision that both the film’s director and director of photography have reportedly signed off on. I know (and understand) that that’s a deal-breaker for many longtime fans. It’s frustrating and, in the end, I wish the film had been presented with its original visuals intact. We’re offering the chance for our readers to win the Blu-ray – click here to enter by 10/25.